There are many mysteries surrounding the final days of the last Emperor of Russia, Tsar Nicholas, and his family. The most perplexing of them all is the fate of one of the Tsar’s daughters, the Grand Duchess Anastasia. Even after Bolsheviks murdered the family in the summer of 1918, rumors circulated throughout Europe that Anastasia (and sometimes her brother Alexsei as well) may have escaped the slaughter. 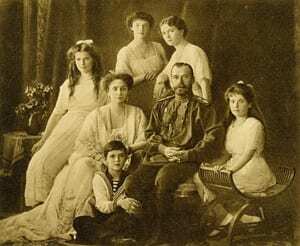 When the remains of the Romanovs were discovered several years later, minus two of the Tsar’s children, the idea that at least one child escaped seemed much more credible. But in 2007, these rumors were quelled when a second burial site was discovered a few miles from the first. This grave contained the remains of two children; preliminary forensic analysis identified them as the Tsar’s son Alexsei and one of his sisters. With the discovery of this second burial all family members, servants, and physicians who were killed that summer evening over 90 years ago were finally accounted for, or so it seemed. Yet in spite of this new discovery, many remained unconvinced. They called for the new remains to be scrutinized – that both the physical remains and their DNA be tested – to make certain that these were in fact the Tsar’s children. So, an international team of scientists undertook this daunting task by examining the DNA of the children in the new burial as well as the DNA in the original burial, to finally put to rest the rumors that have persisted for so long. The team of scientists reports their findings online this week in the Proceedings of the National Academy of Sciences. The researchers began by extracting and sequencing the mitochondrial DNA of the skeletons in the second burial. Because mitochondrial DNA (mtDNA) is present in great quantities in each cell of our bodies, they reasoned it would be easier to find and therefore easier to analyze. In addition, because mtDNA is passed down from mother to children, the scientists knew that they could compare the mtDNA of these skeletons to that of their mother, the Tsarina Alexandra, who was among the skeletons in the first burial. Upon comparing the two children in the second grave, the scientists found their mtDNA to be identical – meaning that they must be related, and probably shared the same mother. And when they analyzed the mtDNA of the Tsarina, they found that she matched the two children from the second burial. Additional tests revealed one of the children to be a boy, and the other a girl, also lending support to the notion that one of the children was the Alexsei, and the other one of his sisters. But the scientists did not stop there. They decided to perform one final test. This test centered around the remains of Tsar Nicholas, found among his family at the first burial site. While most scholars agreed that the Tsar was among the skeletons in this grave, it had not been conclusively proven. To tie up any loose ends, the scientists needed some method of confirming the Tsar’s idenitity. That method came by way of a piece of clothing formerly belonging to the Tsar. One of the Tsar’s shirts, preserved at the Hermitage Museum in St. Petersburg, was stained with some of his blood; blood that contained the Tsar’s DNA. After examining the DNA from the blood on the shirt, the scientists found it to be an exact match to the DNA of the remains at the first burial. Almost 91 years after their murder, Russia’s last royal family is finally all present and accounted for. Be sure to check the Blog again tomorrow, when we delve deeper into the Romanov mystery and explore other puzzles in recent history that have been solved using DNA.